Home Decor: How I Decorate! I receive so many questions about my home decor. I have been dying to share with each of you where I purchase the majority of my home decor. Of course I do shop a lot at Homegoods, because they have some unique pieces, but I can ALWAYS find a ton of B-E-A-U-T-I-F-U-L pieces at this small country store in Lancaster, PA. It's Cocalico Creek Country Store, a hidden GEM! Their Facebook is the most up to date with their newest decor. This Centerpiece was one of my most recent purchases. I pulled a few pieces I liked from around the store and put together a centerpiece. They have some of the most beautiful wreaths. I also got my fall outdoor wreath from their store. I have seen a ton of centerpieces using a wreath and candle set, so these items were perfect. Side note I thought it was time to add in some color to my very neutral themed home. I am loving the sage and hunter greens. This way I can add in some natural looking faux greenery! If you are looking for unique mirrors, clocks, or signage you have to go to this Country store! (Cody Surprised me with this gorgeous clock for my birthday!) If you are religious they have some wonder biblical verses quoted on many of their signs, but I even love my simple welcome sign. One of my favorite "prints" or color to add in is tin. I loved the rustic look. Paired with fresh whites, creams, light taupe, and pale grey it really gives such a shabby chic appearance. I love the mail tins we added in our kitchen. It's an easy way Cody and I keep organized with bills, mail, and tax season! I shuffle these candle holders around my house. I wish I would have picked up more originally. I set battery powered candles in the inside. They are currently in our master bedroom. I love keeping the timer function on these and falling asleep to them beside our bed. I adore the tin with the gorgeous design on these candle holders. 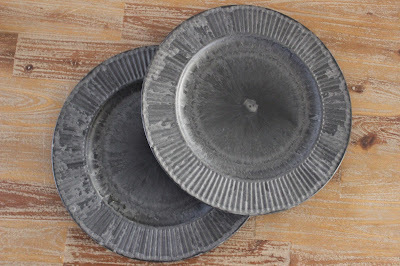 Okay, so these charger plates are plastic, but they look like tin! They match perfectly to the Crate and Barrel Napkin Rings we purchased if you follow me on Instagram, I posted our dining table arrangement this past Christmas. These were a steal! They cost $2.99 each. I love the selection of faux greenery Cocalico Creek carries. I purchases this tin container along with faux hydrangeas. (Which are my favorite flower). They are a nice touch to our 1st floor bathroom moving into spring. I wasn't kidding when I say I decorate my entire house with decor I purchase from this store. Can you tell I am a bit OBSESSED?! This doesn't even include the holiday decor I bought! 1. If they post it on their Facebook, try to get there ASAP! They have limited stock and only purchase a few of each piece. I love this because the inventory is new every time I visit their store. Plus you purchase one of a kind pieces! 2. Their items range in price, Not everything is the most affordable (but I think still so worth the price point). They host different sales around the different holidays. We have gone a multiple times for Easter, 4th of July, Labor day, Thanksgiving, and so on and they typically have some amazing coupons to offer in store. 3. They have an online website, I have NEVER purchased online. They have a better selection in store. I would definitely trust ordering online, but the fun of visiting the store is seeing all the new items! If you are ever in the area STOP! 4. They have 2 different locations, one located in Lancaster, PA and one in Stevens, PA. I have only ever visited the Lancaster store. They are closed Sundays, and have different hours. Check to make sure they are open before you travel there! (I made this mistake before). Pretty in depth for my first home decor post! I hope you guys enjoyed a peak into my favorite home decor store!